Yuri Gagarin - Sea of Dust 7"
Kungens Män is a jam-based psychedelic rock band from Stockholm, Sweden. This double album is their first output on vinyl following a few digital, tape and CD releases. The band was started in 2012 so not bad in such a short time! The line up is composed of two guitar players (one of which also does a little bit of vocals), a drummer and a bass player. Their music is mostly rather peaceful and dreamy, but they also now how to rock at times. All jams on this album are pretty much based on one simple riff, but they grow and mutate on their way to keep things mind-blowing and interesting enough. The album starts off with the laid-back "Järnvägsdröm" that also has vocals. The track gets more intense towards the end but stays in one chord for the whole duration of almost ten minutes. The title track "Förnekaren" gets more spacey and has some heavier guitar and groovier beat. This reminds me of ST 37 or Bardo Pond or something like that, experimental, hypnotic, heavy space/kraut rock with some post punk vibes thrown in. One of the highlights for me, although the instrumental track stays pretty much the same without that much variation. The longest track is the 22-minute "Sista Ordets Krigsdans Genom Snickeriet" that is more ethereal again, and very hypnotic and trance-inducing. It does get more intense and heavier later on, great! 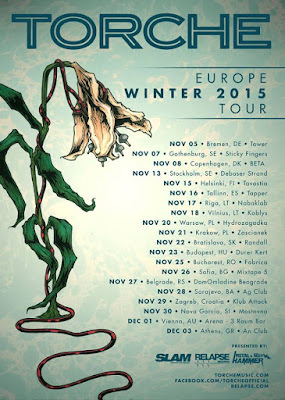 Sounds a bit like the spaced-out improvisations of Tribe of Cro or Øresund Space Collective. "Krautespark" is the shortest track at 6:36 and has a more energetic drum beat, while the guitar players try out different things on top of it. "Kringströdda Silverbestick" has at first a sort of melancholic, old Swedish folk music sounding melody that Hills of Goat might use, but it soon dies out and the groovy, sort of funky rhythm is in focus, until things cool down later. Coming up next is "Förensligandet i det Egentliga Aspudden" that starts off very peacefully and in a dreamy way, but a repetitive kraut styled percussive beat takes hold little by little. The guitars play some very cool stuff on this one. The album is finished with the slow, subtle and experimental "Hur Ska Vi Stå?" that has some weird little psychy noises and effects going on. Tribe of Cro comes to mind again. This album can be recommended for the lovers of repetitive, hypnotic and spacey improvised space/kraut rock in the vein of Zone Six, Electric Moon, Tribe of Cro or Øresund Space Collective, but without the synthesizers. Fashion - Songs Written by David Bowie is the next annual Fruits de Mer club-only freebie CD that you can only get by having bought pretty much what the label has put out this year. So this won't be on sale anywhere and is really a CD and not on vinyl like normal FdM releases. For some reason Bowie hasn't been covered before on FdM, so I guess it was about time for something like this to happen. The 15 songs on the disc performed by 15 acts cover most of Bowie's career from the the early days through big hits all the way to his 1977 Low album. Most of the featured bands and artists are FdM regulars like Sendelica, The Past Tense, Sidewalk Society, Jack Ellister, The Seventh Ring of Saturn etc., but there are also a few newbies (The NoMen, Consterdine). I must say that I'm not the biggest Bowie fan but you just have to give credit to the man and his music, so this actually is a pretty exciting album. I won't go through all the tracks here, but some of my favourites include the pretty psychedelic "Can't Help Thinking About Me" by Sidewalk Society, the energetic "The Gospel According to Tony Day" (The Nomen), the tranquil "Tired of My Life" (Ilona V), the groovy "Black Country Rock (Cary Grace), the spacey and folky "Andy Warhol" with great female vocals (Mooch), the rather authentic sounding "Life on Mars" (Sheepshanks), the quite out-there "Drive-In Saturday" (Jack Ellister), the very cosmic "African Night Flight" (The Seventh Ring of Saturn) and the warped, fuzzed-out version of "Fashion" (Blue Giant Zeta Puppies). Okay, that's most of the tracks in my highlights list then, but I can't help it! The rest of the cover versions are not bad either. Sendelica ends the disc with their peaceful, acoustic live version of the classic "Ziggy Stardust", which is great too. To make things more confusing this free album is released in six different covers that will be sent to regular customers randomly. This sounds so fishy that only Fruits de Mer can come up with something like this! This will be the first picture disc vinyl with Fruits de Mer Records. Since the music is very ambient, peaceful and atmospheric in nature, it will be released on their sister label Strange Fish (remember the five instrumental albums released in 2013 and Craig Padilla's 2LP Sonar the following year?). Michael Padilla (no relation to Craig...) is best known as a member of psych rock/dream pop band The Soft Bombs, but here he uses just sampler and a looper pedal to create very soothing, minimal and meditative soundscapes. There are one longer and one shorter instrumental track on both sides, and the free CD will also have a fifth extra track that is not available on this promo CD-R I'm just listening to. Now, I must say that I don't listen to this kind of ambient music that often, but every now and then it's worthwhile to lay down, put your head phones on, relax and float away from all the troubles and stress of this world with some cosmic ambient sounds, and Atmospheres is great for just that. You can also use it as peaceful background music while reading for example, and it's not total drone or anything and also has some melody to keep you focused, so you can enjoy it in other ways too I guess. It could also be used as a soundtrack music for some film. If you are one of the more rock/pop/song oriented Fruits de Mer fans you might get a bit bored with this one, but if you enjoy ambient instrumental music like Eno this is definitely for you. 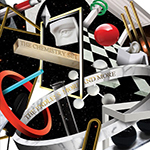 The Chemistry set from London, UK, were one of the pioneers of the neo-psychedelic scene in the late 80s/early 90s. They have been more active again during the recent years releasing three singles on Fruits de Mer / Regal Crabomophone and also playing live. Strange enough, The Endless More and More is in fact their first actual new studio album for decades. Most of their other releases have been singles, EP's, Mini Albums and compilations. This superb new album was carefully recorded and mixed during the recent years and includes some songs from their vinyl singles on Regal Crabomophone, but not all of them. There are 12 tracks on the album that lasts for 55 minutes which might have made it hard to fit it all on one vinyl. The album starts of with the marvellous unreleased new track "The Splendour of the Universe". This band really has great and catchy melodies! A perfect pop psych song with vibes from the 60s, 80s and 00s, if you ask me. "The Fountains of Neptune" is a bit more psychedelic and hypnotic and rocks a little harder which is great. Another winner! "Internal Rescue" has some The Beatles / The Byrds vibes and again excellent melodies. "Time to Breathe" was released as a single in 2012 and it's a more peaceful, dreamy and atmospheric track with cool psych effects and a hazy mood. The sort of garage rock / pop styled "Come Kiss Me Vibrate and Smile" (the B side of the aforementioned single) should have been a huge hit in some alternative universe, and probably was. Very catchy indeed. I must also say that I love the band's harmony vocals... On "Winter Sun" the band cools down for a beautiful, folky ballad mode with acoustic guitars. "Albert Hoffman" is one of the trippiest songs on the album and a great homage to one of the most important figures in the psychedelic circles... I think I can hear some early Pink Floyd in there. Mind-blowing! "A Cure for the Inflicted Afflicted" (from Elapsed Memories 7") is more energetic and brings to mind The Stones. "The Cranyon of the Crescent Moon" is a typical, melodic neo-psych pop candy, and "Crawling Back to You" a piano-driven thing in the vein of Lennon/McCarthy. "Elapsed Memories" is a melancholic, touching, gorgeous but also rocking song that makes the cold shivers go though your spine, it's just so good and one of the highlights for me. The last track "The Open Window" is more mysterious and mind-expanding stuff with some Eastern influences, and a great, mesmerizing way to end this stunning album. Please do yourself a favor and pre-order this beauty right away so you won't miss out. Essential stuff for all lovers of great melodic psych pop / rock! 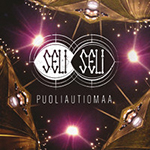 Seli Seli is a fresh new psych rock band who released this debut album of theirs a few months ago. They have a very pleasant, hypnotic and dreamy style that sometimes gets a bit heavier but mostly they are mellow and mesmerizing. Just the kind of music that should be listened to eyes closed and mind open. They do label themselves as inner-space rock band and I think that's a perfect description. The quartet (singer/guitarist, guitarist, bassist/backing vocalist and drummer/backing vocalist) is enhanced for the album with a female backing vocalist (on "Langat", "Rotat" and "Unessa") and organ player (on "Unessa"). The album starts off with the excellent, hypnotic and dreamy "Langat" that has airy and psychedelic delay guitar work and a nice, mid-tempo beat. Some of it brings to mind Kingston Wall a bit. The vocals are in Finnish, which is not that typical for a band like this, but after a while I got used to that and they are actually very good. The organ (sounds more like a keyboard to me) is a great addition to the floating atmosphere, and there's also some fuzzy lead guitar, but it's not too aggressive. Very cool! The title track "Puoliautiomaa" is definitely one of the most rocking and heaviest piece on the album and I can hear echoes of Loop, Mana Mana and other heavy, hypnotic guitar psych bands, even Hawkwind! The track cools down a couple of times, which works fine. One of the highlights for me! On "Värivaloissa" the band mellows out again what comes to the guitar sound, but the track has a steady, krautrock style motoric beat. I love it when the track grows later on for the guitar solo, some heads are going to explode! 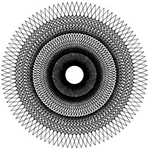 "Rotat" is a Circle styled, a bit heavier, hypnotic krautrocker and the most intense song on the album. "Unessa" is more atmospheric stuff again, but another great song, and has a cool, melodic ending that brings to mind The Soundtrack of Our Lives or something like that. The album ends with "Laulu menneestä elämästä" and this one has a strange, jazzy beat and differs quite a lot from the rest of the tracks. Maybe something that Kauko Röyhkä or Tuomari Nurmio might have done after some mushrooms? Some cool lead guitar towards the end. All in all, this is a great debut album from a young band and my only complain is that it's not out on vinyl (yet...). Can't wait to hear some more, Finland and the whole universe needs bands like this! One of this year's best Finnish releases. Dj Astro to spin vinyl at the Torche/Seremonia/Throat show this Sunday! Who says that Sundays have to be boring? US stoner rock band Torche will play at Kuudes Linja in Helsinki on 15.11. supported by Seremonia and Throat. Dj Astro will spin some cool psych/stoner/metal before, in-between and after. Come to the party and have some fun! Unimother 27 is a one-man band of multi-instrumentalist Piero Ranalli from Italy. I have reviewed Grin, one of his first CD's for the original Psychotropic Zone years ago. On this brand-new album he is aided by Mr. Fist on drums and percussion. Whether or not Mr. Fist is a real person or not I don't know, since all the drums and percussion sound programmed like before. I sometimes have issues with programmed drums, but they sound okay here. 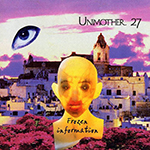 The mostly instrumental music of Unimother 27 is a cool mix of experimental, psychedelic, kraut and space rock, and it's done in an exciting and talented manner so of course I like it. Even the sound quality has progressed a lot during the years, although I have a strong feeling that this was all made in a home studio. The opener "Moksha (to Huxley)" starts off with some mystical sounding keyboards, and pretty soon it gets moving in a slow, jammy mode. The great, twin fuzz guitar soloing reminds me of The Bevis Frond or Outskirts of Infinity. Later on the beat gets more intense (think Pressurehed etc.) and the soloing just goes on until the peaceful mood of the beginning returns. Nice! "Dancing Thought" is more experimental, progressive and also faster stuff. I'm getting some later King Crimson vibes here for some reason. The almost eight-minute "The Obvilion's Cage" begins slowly and in a weird manner and stays pretty experimental and odd for the whole duration. "Clear Light Healing" has an ambient intro but starts rocking later on. This one also has some very psychedelic, manipulated vocals... Weird stuff for sure! My favourite on the album is the hard rocking kraut/space rock piece "For Mad Stray Dogs Only" that really gets the adrenaline pumping in your veins. Sounds a bit like Hawkwind, Helios Creed or Chrome! "Hymn to the Hidden God" is at first a more mellow, experimental and strange number that also reminds me of some of the Chrome stuff, although it gets going and the solo guitar work sounds more like Nick Saloman or Bari Watts again. The last two minutes are weird, more minimal and mellow going. The album is finished with "Brief Moments of Eternity", a partly celestial, partly chaotic and fully mind-altering track with narration from Jack Kerouac's book The Scripture of the Golden Eternity. Whoa! Check this guy out if you are into experimental psychedelic music. This is a very limited lathe-cut 7" vinyl single that will be out next month on Fruits de Mer's sub-label Friends of the Fish. Only 50 copies will be on sale for those on the Fruits de Mer mailing list (and I guess the bands will have some too). Okay, I got to say that The Bay City Rollers was definitely not a band I would expect to be covered on a Fruits de Mer related release but that will happen anyway, and this really isn't the first time I'm surprised. Well, to be exact "It's a Game" was originally written by String Driven Thing, but The Bay City Rollers made a hit out of it. Ex Norwegian is a new band to me (as well as for Fruits de Mer), and are from Miami Beach. Maybe the sunny atmosphere explains this very happy sounding cover version that's almost disco. 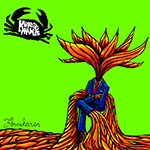 Somehow the band still make it sound like it belongs to the Fruits de Mer catalog, well done guys. The song sure has some great, catchy melodies, and the execution is spotless. On the flip side we have Finland's own Permanent Clear Light who have amazed the audiences with their Fruits de Mer single/compilation appearances and debut album Beyond These Things. Their original "Cornerville Skyline" is a perfect psych pop track and has a very nice, cheerful mood. The 60s influence is very obvious, and I love the vibe of this melodic, emotional masterpiece. Can't wait to hear their second album sometime nest year! 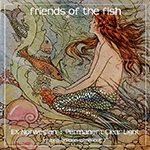 Having sadly missed the two first lathe-cut singles in this series (CD-R promos reviewed here), I really hope I can get this one somehow, but I know the demand will be huge all over the world for such a collector's item... Good luck! 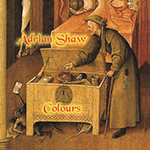 Colours is the seventh solo album by Adrian Shaw, the legendary bass player (ex-Magic Muscle, ex-Hawkwind, The Bevis Frond, Hawklords etc.). It's been over ten years since his latest solo effort String Theory, but Oxygen Thieves, the album with old band mate Rod Goodway was released in 2009 and Ade has been busy playing and recording with The Bevis Frond and Hawlords among other things. I have always admired his ability to write interesting, psychedelic, enjoyable and yes, even catchy songs and he of course is a killer bass player who can also sing and play many other instruments like guitars, keyboards, drums, lap steel and mandolin. On this brand-new CD he is accompanied by Frond drummer Dave Pearce (on "The Question of Life), his son Aron Shaw (guitar solo on "The Divine"), the great Bari Watts (lead guitar on "When I'm Gone" as well as another old friend Pete Pavli (viola on "The Dream"). The quite heavy, great mid-tempo opener "Colours" is definitely a reminiscence of the original hippie times in the late 60's. You know, the free love, dope, experimentation in music, art etc, revolution, all that. Ade remembers the highs and lows for sure... "A Clean Slate" is a beautiful track that also features acoustic guitar, killer solo guitar, heavenly keyboard melodies and other cool things. "When I'm Gone" is a shorter, heavy psych rocker in The Bevis Frond style and Bari of course shines as always. "At Last" starts of with some orchestrated stuff but is then quite normal but (very good!) mid-tempo rock. "The Divine" is shorter, rather hypnotic hard rocker in 7/8 with very cool harmony vocals. Aron's guitar solo is perfect for the song! The blissful folk song "Going Home" is just wonderful stuff... "The Dream" is a very melancholic, atmospheric, slow and a bit dark piece and Pavli's viola adds some High Tide vibe I think. Excellent. "Be Not Weak" is one of the most psychedelic tracks on the album and reminds me of "Tomorrow Never Knows" by The Beatles. It has a similar beat, backwards sounds etc. and you really can trip to it. Next, "So It Goes" is a nice, melodic mid-tempo piece that I really like as well. The album is finished with the slow and melancholic "The Question of Life" that has an experimental beginning and Vocoder vocals and some other trippy effects. Cool! A great way to end this superb album. 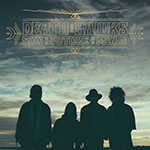 Be sure to check this out if you are into good, deep rock music with a psychedelic edge. You can now find Ade at Facebook. 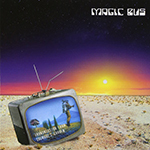 Magic Bus is an English prog rock group who combine the sunny, relaxed vibes of late 60's US West Coast to the more progressive, jazzy and adventurous sounds of Canterbury bands like Caravan and Soft Machine as well and Yes and Camel, just to name a few. The band includes two guitar players (one is also a vocalist), a keyboards player, bassist, flute/recorder player and a drummer. Most of them also sing backing vocals which is essential in this kind of music. Transmission from Socmore's Garden was released last year following their 2010 self-titled debut. Both albums are sadly only out on CD, and I do think they deserve a proper vinyl release... They do also have two marvellous 7" singles out: Magic Bus (Static Caravan 2011) and Seven Wonders (Regal Crabomophone 2015) that I recently reviewed over here. The albums starts off with the cheery "Sunflower" that sounds very much like '67 San Francisco. Some nice organ and guitar solos at the end! The excellent "Ballad of Lord Sogmore" gets more progressive and reminds me of Caravan and Camel, I love it! The vocals are superb and melodies just magical. "Cosmic Rays of Dawn" is a pretty laid-back, mellow song that also has some folk influences. The bit longer "Three Days" has a nice, sunny vibe and also some jazzy prog sections. The longest track is "Jupiter 2 AM" at 8:37 and it has some wilder/heavier Yes/King Crimson elements in addition to the strong, atmospheric Canterbury vibe. Wonderful! Another highlight for me is the beautiful single track "Seven Wonders" that has a magical mood. "Morning Mantra" is a perfect mix of The Beach Boys and Canterbury scene, and the final track "Earthpod" somehow brings to mind The Moody Blues (it's probably the Mellotron sounds...) which definitely isn't a bad thing. All in all, this is a very pleasant album full of great melodies, talented musicianship and adventurous song structures and keeps you interested for the full 46-minute journey. Have a try!